Dell's exclusive Ballistic Armor Protection System featuring PR481™ chassis material provides twice the impact strength versus traditional magnesium alloy. With PrimoSeal™ technology, we provide the highest combined Ingress Protection rating (IP65), for enhanced protection against blowing dust and liquid. Dell is committed to providing you the commonality, tools and service offerings to simplify IT management, so you can focus on the mission at hand. The XFR shares the image and peripherals with the corporate-class Latitude E6400, helping you achieve a system commonality and a lower total cost of ownership (TCO). The XFR features Intel® Centrino® 2 with vPro™ technology, providing built-in manageability and advanced security features. Dell ProSupport service offerings help you deploy systems easily and quickly. The high-performing, fully rugged laptop is the first in its class to ship with both Intel® Core™2 Duo processor with vPro™ technology and optional discrete graphics. The Latitude E6400 XFR has brains as well as brawn. QuadCool Thermal Management System enables the XFR to meet the MIL-STD for temperature extremes and supports world-class performance, while running the latest Intel® Core™2 Duo processors. Optional solid-state drives (SSD) can deliver increased durability and improved system performance. 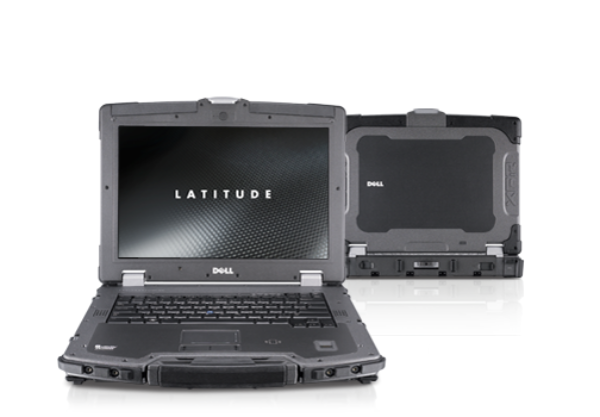 Latitude E6400 XFR features securely sealed port covers and a wide range of key peripherals to work wherever you need it to. Work in direct sunlight with the large 14.1" wide-aspect LCD featuring Direct Vue™ Technology LCD. Work with vehicle docking, which allows flexibility for police and field technicians to mount systems directly in their vehicles where they work. Get secure, simple, locking doors with PrimoSeal for exceptional protection while working in wet or dusty conditions. Dell ProSupport — Faster, more reliable support services designed to address the technology challenges you face today. This new support portfolio is focused on your needs, time demands and budgets. Designed for organizations with limited or no dedicated IT staff. International Onsite Service after Remote Diagnosis* — Provides service and support for your Dell laptop while you are traveling.